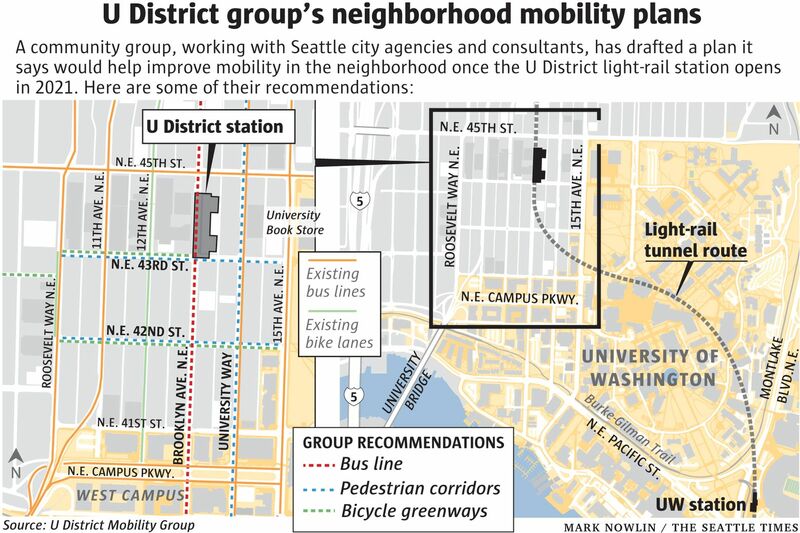 A U District community group created a detailed transportation plan in hopes of avoiding what it says are shortcomings in the transit connections for riders at the University of Washington light-rail station at Husky Stadium. Even before the light-rail station opened at Husky Stadium in 2016, Cory Crocker worried about the distance passengers would have to walk between the bus stops and the trains. Bus riders get off on Northeast Pacific Street and then cross busy Montlake Boulevard or take a four-minute walk on a pedestrian overpass before descending 90 feet to the station platform. Crocker wanted better transit access when a new light-rail station opens in 2021 in the University District, where he has lived for nearly 30 years. “The transfers between buses and light rail were horrendous,” he said about the UW Station near Husky Stadium. 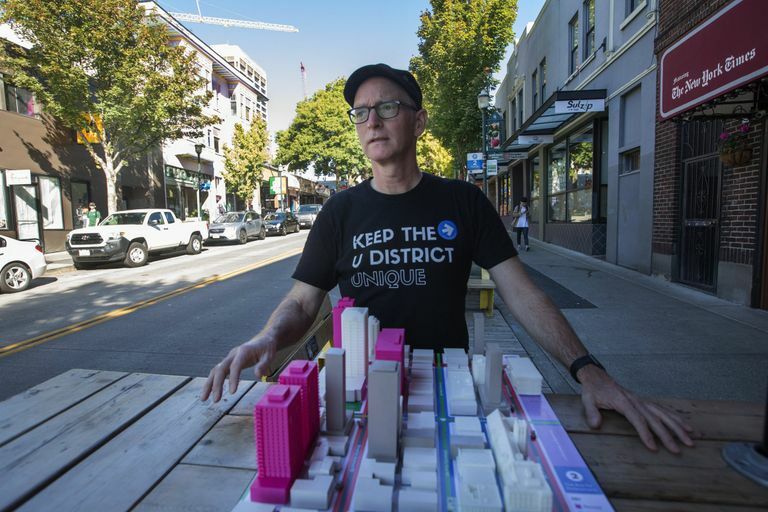 “We’re thinking that we want to avoid the mishaps that we have down there,” said Crocker, a volunteer advocate in the University District community, during a walking tour of the neighborhood this fall. So Crocker and other residents, business owners and U District representatives began meeting to figure out how people could best get around the neighborhood once the station opens. Also on the horizon are possibly thousands of new housing units and a massive University of Washington expansion. With help from Seattle City Council members, local transportation agencies and a team of consultants, the U District Mobility Group became the first community organization in Seattle to create its own comprehensive transportation plan in response to a new a light-rail station. The plan, among other things, recommends new bus routes, improved pedestrian and bicycle corridors, and limits on some vehicle access — all in an effort to handle the 12,000 daily riders expected to board trains at the U District Station by 2030. Whether the city will adopt the plan in its entirety remains an open question. There’s no precedent for a community organization to create policy this way, said Amy Gore, legislative aide to City Councilmember Rob Johnson, who worked with the U District Mobility Group. And some proposals might conflict with Sound Transit’s station design and the layout of existing streets, officials said. But some recommendations could be incorporated into the city’s existing master plans for bicycle, pedestrian and transit access, Gore said. Crocker and other neighbors initially contacted Johnson’s City Hall office in October 2016 to discuss the impact of the station, located at Brooklyn Avenue Northeast between Northeast 43rd and Northeast 45th streets, and the city’s plans for handling it. Johnson scheduled time to hear from the community, but ultimately “the city didn’t have the capacity to take on planning,” Gore said. So local government agencies and private businesses pitched in money to fund a study of the street layouts and opportunities for change. The largest source of funding for the study — $42,000 of the nearly $90,000 total — came from a grant by the Seattle Department of Neighborhoods. With the money, the group hired consultants from architecture, design and urban planning firms. - Routing buses onto Brooklyn Avenue Northeast. - Widening sidewalks on Northeast 45th, 43rd and 42nd streets to accommodate pedestrians coming and going from the station. Some blocks of 42nd and 43rd would be designated “greenways” to prioritize walking and biking. - Designating 12th Avenue Northeast as a bicycle corridor for leisurely travel. Bike lanes on 11th Avenue Northeast and Roosevelt Avenue Northeast would handle northbound and southbound bike commuters. - Prioritizing University Way, also known as “the Ave,” for pedestrians. Vehicle traffic would be limited, with business deliveries restricted to early morning hours. The community group is advocating for the adoption of a single, comprehensive plan that “shows all the moving parts,” Crocker said. But it also would support implementing the recommendations through changes to existing master plans that guide projects for pedestrians, bicyclists and transit. Sound Transit began designing the U District light-rail station in 2010. Excavation began in 2014. Next year, King County Metro will start planning new bus routes through the neighborhood. The agency says it will focus on avoiding congestion at big intersections, identifying routes that need more service and easing the transition for riders between buses and light rail. Crocker said community members have voiced “overwhelming support” for a street design on Brooklyn Avenue Northeast that would allow buses to travel down the corridor, which runs right by the new station. But the 10-foot travel lanes now on Brooklyn are not wide enough to handle buses, which need at least 10.5 feet. And Kimberly Reason, a spokeswoman for Sound Transit, said moving the buses would also conflict with the design of the station, delaying completion of the project. With at least two years before the station opens, the U District Mobility Group sees plenty of time to incorporate some ideas into the agency’s plans, Crocker said. Bill Bryant, a service development manager for Metro, said the work by the U District Mobility Group is a “pretty good model” for how a community can engage in transportation planning. But he acknowledged it may not be easily replicated because the group was able to secure substantial funding from a number of sources that others may not have access to. The community group hopes the plan will be reviewed by members of the Seattle City Council’s Planning, Land Use and Zoning committee in the coming weeks.